All this week I have been devising a big, multi-part screencap extravaganza, to "clear the shelves" of all the caps I've already prepared; caps I've had waiting for weeks and months. 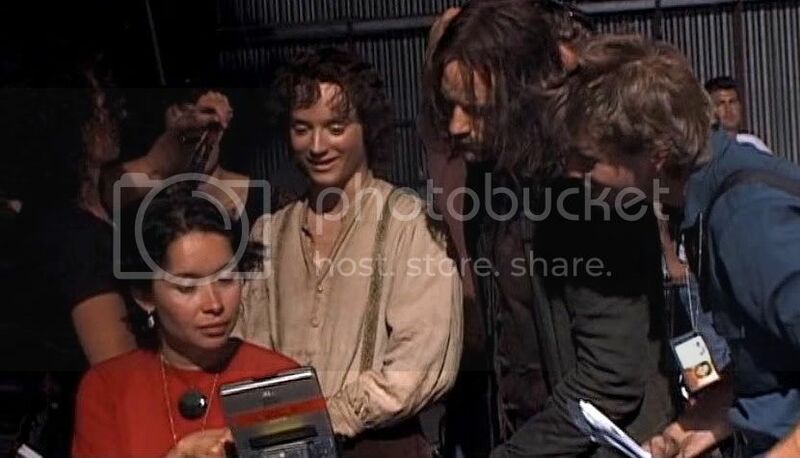 Nearly all of them are from the end scenes of RotK and from the EE documentary, "Cameras in Middle-earth". I am still writing and laying out this series of at least ten entries, since I also want to feature selected text excerpts, four poems by jan-u-wine, and a fic by Pearl ( aka pearlette aka Diamond of Long Cleeve aka Nienna), which the cap series will illustrate and vise-versa. 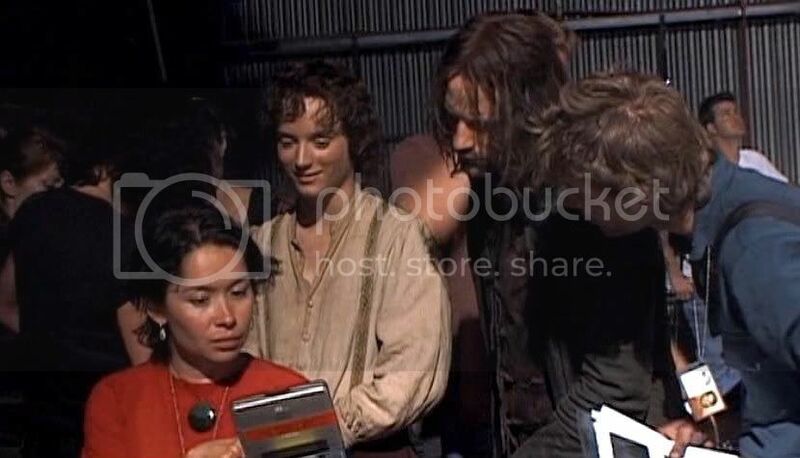 Here are some visual hushpuppies -- screencaps I made from Cameras in Middle-earth, all tweaked and ready to post. Most of them will be familiar to you; many of you will already have them on file. But only in making the caps did I add these to my own collection. 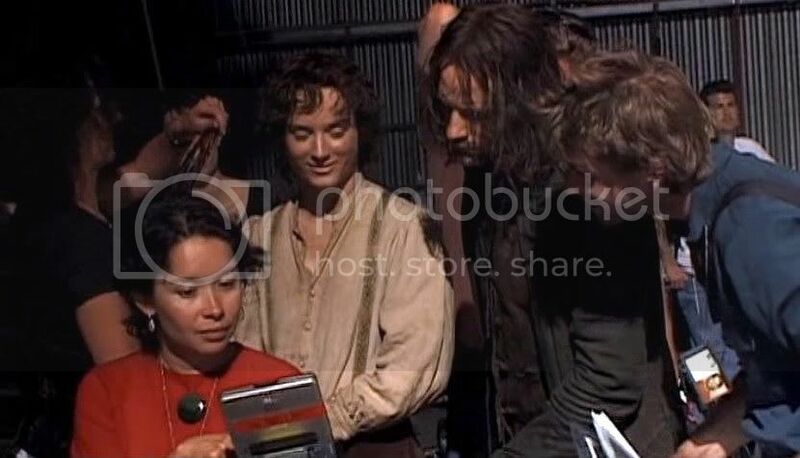 I liked this little set below because Elijah Wood in his Frodo costume, his face darkened with make-up dirt, looked so like a saucy, naughty Pan in them. I have always been pleased with the "faun-ness" of PJ's young film hobbits, but this Frolijah-faun is irresistible. Here's a statue by 19th century Danish sculptor Berthel Thorvaldsen. Its over-all look reminds me of Frodo-faun above(if only he were smiling! ), but in classical art. This is a human boy, but he'd make a fine faun if his legs were furred up. Or a fine hobbit, if the fur were limited to the tops of his feet. 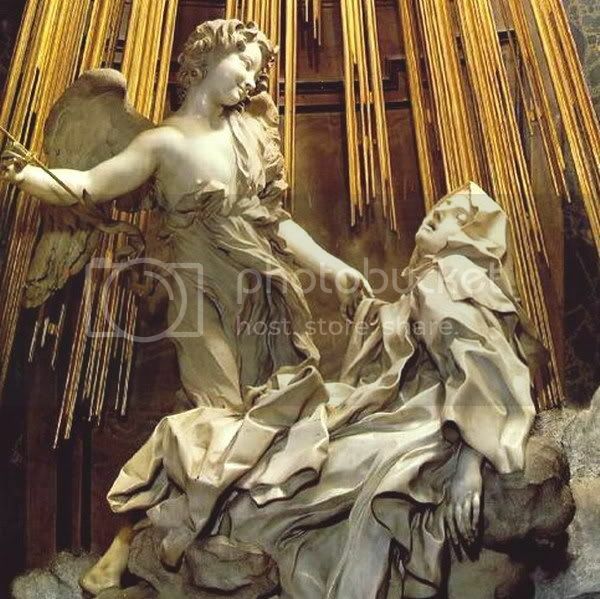 As for Pan-Frodo's face, so full of mischief and delight, I tried to find a close-up of the angel's face in this renowned Bernini statue (the one of the Cupid-like angel delivering St. Theresa to ecstasy by piercing her with an arrow), but I could not. I used to have a copy but have lost it, somehow, perhaps in one of our computer crashes. If anyone has a face close-up of the angel's face, I would love to have it. Many of you know I love this sculpture, seeing in it a representation of how film-Frodo wounded me through the eyes with his beauty, making me besotted (and continually ecstasy-prone). I even made a humorous Frodo Art Travesty out of it, back when I was first making these manips. 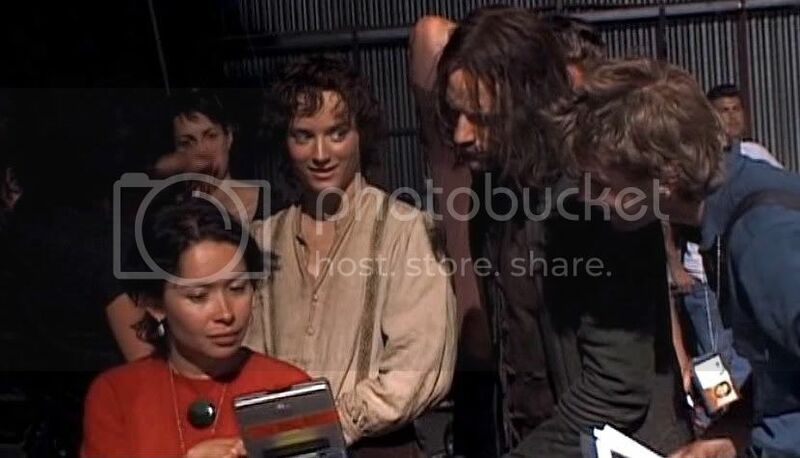 The handful of screencaps below, all from Cameras in Middle-earth, are ones I have seen elsewhere. I offer them here just in case some of you haven't saved them and wanted to. I tweaked them a little as usual, to improve the contrast and lighting. 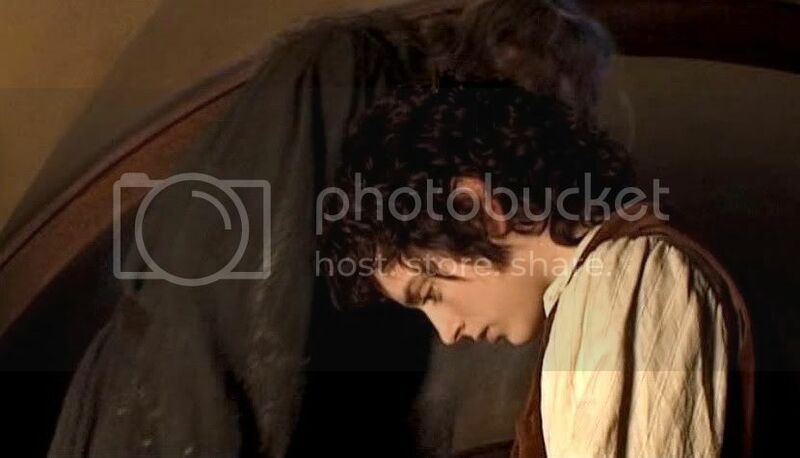 I never noticed until making the manips that Gandalf's scale double is standing behind Elijah in the profile shots. Somehow I had thought it was taken on Frodo's last day of shooting, but Gandalf was not in that scene, of course. ETA: It's not the scale double; it's Ian McKellen moving about back there, but apparently on some sort of platform. The three caps below are from the famous "push-up" series, in which Elijah Wood is preparing himself to look stressed and breathless for a Mt. Doom take. Ariel (aka elasg) posted a most amusing gif of this, as I recall (*snicker*). The three below are the most in-focus frames from the sequence. A posterior of great charm, I would say. "Pert", I believe, is the favourite descriptive of fic writers. Query: Is anyone else having trouble with trying to select text using their mouse pointer? I can no longer select a text for copying, cutting, or pasting. It is most annoying! I tried out the new "Horizon" viewing option for LJ, found out that I could no longer select text to copy/paste... and went promptly back to my old "Dystopia" view. These are wonderful caps, Mechtild. Thank you for this lovely Froday gift! Thank you, Shirebound. What are "viewing options"? Where can they be found? Do you mean change the style/format/look of the LJ itself? I hope not; I don't want to do that; I did custom colours and font faces for this sucker! But this not being able to delete except by using the backspace it TERRIBLE. It worked just now while writing this comment; I tried it (selecting a piece of text with the mouse pointer). I'll open up the entry to edit it and see if it works. Thanks! I can no longer select a text for copying, cutting, or pasting. It is most annoying! I had the same problem, but apparently it works now. 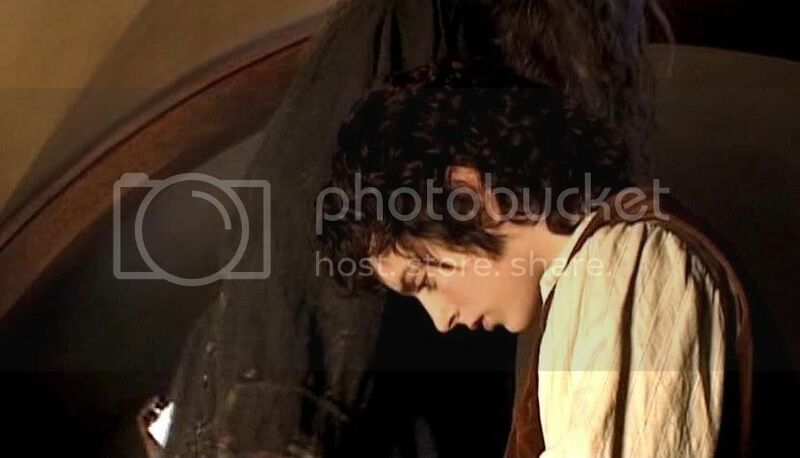 Yes, that would be a lovely pose for him (well, for Frodo, if I had my druthers), but only if he weren't looking at me. I love the relaxed, unguarded attitude of the boy in the sculpture, only possible because he is unaware of the gallery of viewers sighing over him. I am going to try selecting some text after I post this comment, Bagma. Thanks for answering the query. Mews, you crack me up *hands tissue*. Yes, he does have "that look". *slather and swoon* Bagma thought he'd be good posing like the shepherd boy, too. "Great minds..." etc. "Famous push-up sequence"? Where have I been? *sigh* Maybe it's more like where I haven't been: the Harem! Where HAVE you been? I think I saw it in Ariel's LJ, anyway. But I'm sure she posted it in the Harem. It's very short, as gifs are. Which is not surprising since the moment in the Extras lasts for an eye-blink. The gif is a riot. 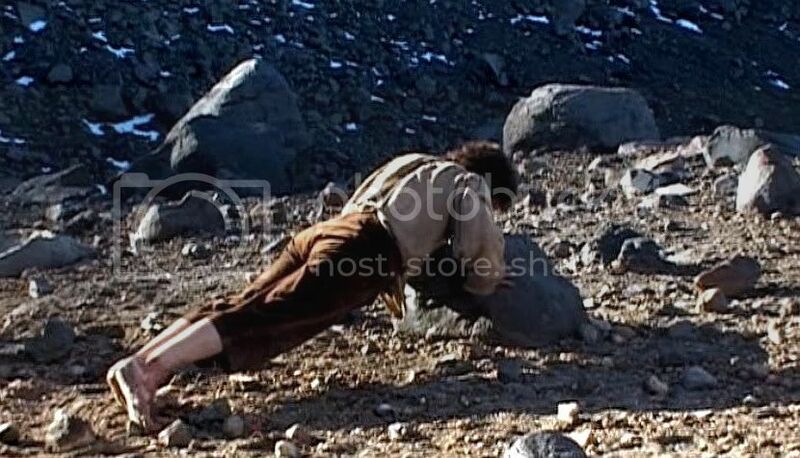 Not because there's anything unusual about a man doing push-ups, but because all the viewers of it are thinking other things and everyone knows it. Crack of Doom? You know, Honey, I never made any screencaps for the Sammath Naur. I figured it had been screencapped to pieces. I remember first seeing all the screencaps, gobs of them, posted on Shadow's journal back when I didn't know what LJ was. 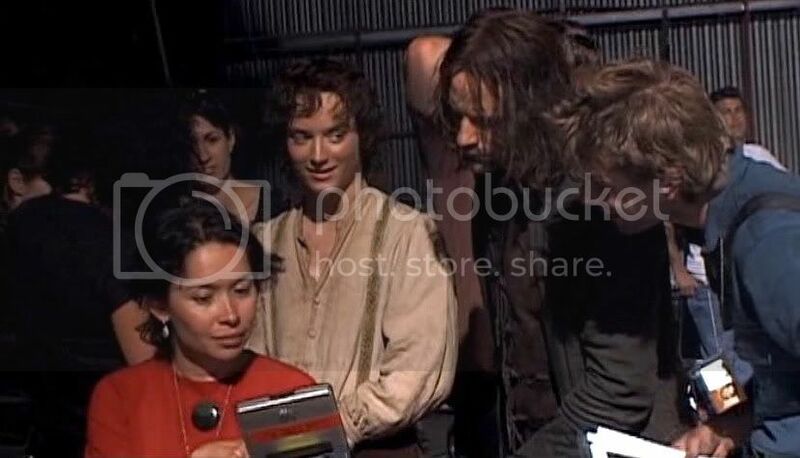 Wendy just kept providing mysterious links to this place where all these mouth-dropping shots of Frodo inside Mt. Doom were being posted (this was before RotK had even been released in theatres). I'll think about it. I was planning to do this one giant series and have done with screencaps for a while. I am waaaaaay long past due writing my story, and making screencaps and presenting them, finding texts and poems and fiddlling until I love the look of the whole thing, is extremely fun but extremely time-consuming. Mechtild, you take us to Screencap Heaven! I love that mischievous look on Elijah's face. 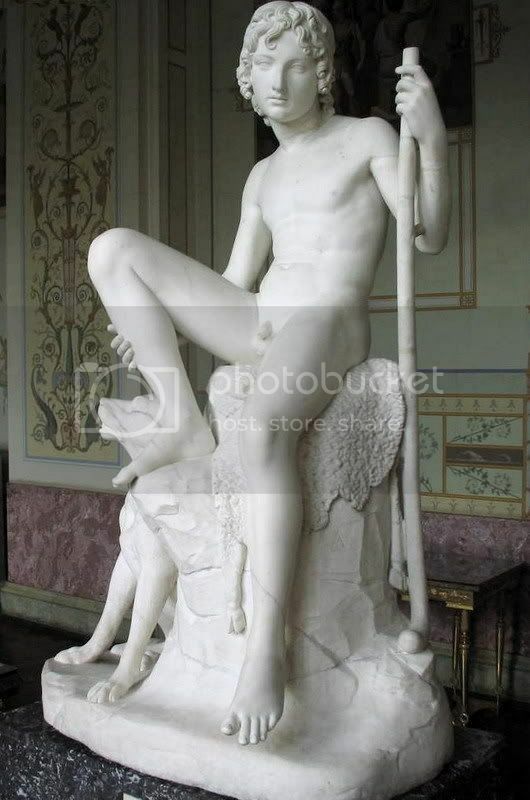 What a great statue of Pan. Thanks for linking. You are welcome, Lily. His expression really is full of spice, no matter what he was actually saying at that moment. Thanks a lot sweetie for this wonderful post! And I'm fascinated as usual by the way a lot of classical artworks (paintings or sculptures) have a strong resemblance with Frodo's features. I've never heard Boromir or Theodred's bottom described as "pert". Maybe it's a hobbit thing? Now I feel inspired to come up with suitable adjectives to describe the bottoms of the other, magnificent, males of Middle-earth. Aragorn's bottom - majestic! Boromir's bottom - formidable! Legolas's bottom - still the prettiest! Eomer's bottom - hooo boy! Faramir's bottom - Pearl stops breathing and averts her eyes in reverent silence. Frodo's bottom - deliciously pert. Yup. It's a hobbit thing. Just running in to say thank you again for finding and improving these lovely screencaps. Can't stop long enough to drool, must go and finish packing. Have a lovely time, Brummie! Thanks for stopping by on the way. Thank you Mechtild, a beautiful post full of beautiful images and sculpture. 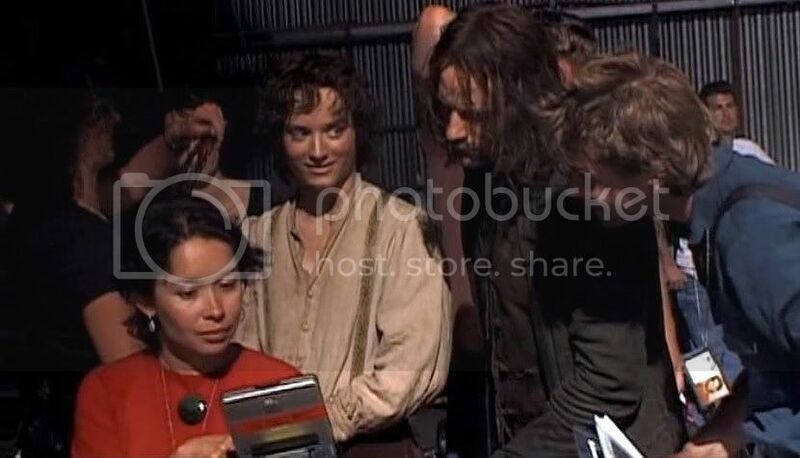 Can't get enough of that lovely hobbit face! And the push ups! I had no idea he did those to look stressed! Thanks so much for posting these. I don't think I really will buy the extended only because I think it's a rip off, and I already have two copies of each movie!!! But wish I could just get the disk that has all of the extras. *sigh* I may still cave...who knows. You are welcome, Love Those Hobbits. Yes, there were shots in the Extras shwoing Sean Astin doing deep knee bends and hyperventilating to get himself geared up to film part of the "Go Home Sam" scene. They have to wait around so long between takes, they do anything they can to get themselves back into the groove of the scene quickly. Why not rent or borrow them? Someone who has bought them and already watched them offered to lend them to me. She mailed me her copies, which was terribly sweet. But if she hadn't done that, I would have looked for them to rent. If I love the extras, I'll buy them, since they are each the price of one regular movie. (I own all the other versions, too.) Another fan says she is going to download the extras off the internet, since she is sure they'll become available that way.